It is 7 o’clock in the evening. Kennedy Mofolo has a torch strapped to his forehead deep inside a cave making quarry stones for his family’s daily survival. Mofolo looks weary but he refuses to retire because all he wants is to break the cycle of poverty that has trapped his household for the past 20 years. Listening to traditional songs sung by his wife and children deep inside the dangerous cave gives him more energy as he continuously breaks the stones. Mofolo, from Group Village Lipalama in Traditional Authority (T/A) Chimutu in Lilongwe, is one of many Malawians in various districts engaged in artisanal and small-scale mining (ASM). Every morning, he and his family members trip towards a deep cave near his home in search for rocks to break and sell for survival. “I have no land where I can grow crops and I am not employed. The only available resource is quarry stone. Despite being a tedious job, I find peace and comfort in it,” Mofolo says. Just like any other family is happy when an opportunity arises, Mofolo celebrates each time he finds a black and huge quarry stone. “Customers like to buy the black and glittering quarry stone. No matter how many heaps of quarry stone you have, it sells like hot cakes,” he says. Listening to his story, one may be tempted to abandon their white-collar job and join the business. But, this is not for the faint-hearted; it requires commitment. Mofolo’s path to quarry mining started in 2007 due to many challenges his family was encountering, principle among them being food shortage. He says before venturing into mining, he worked in various tobacco companies such as African Leaf, Alliance One and Limbe Leaf in Kanengo. But because it was a seasonal job, it was hard for him to manage the family with a two-month salary. “I have never worked beyond two months ever since I joined the tobacco industry. I often found myself in an awkward situation as I couldn’t take good care of my family. “I made a decision to venture into quarry mining business because I had children and grandchildren to look after,” he says. Mofolo is now able to make enough money for food and school fees for his children. “Three of my children are in secondary school and three others in primary. I provide them with support through the money I realise from sales of quarry stones. “I am optimistic that should my children be selected to universities, the support will still be available,” he says. The Lilongwe-Chezi resident has also built a house and roofed it with corrugated iron sheets, owing to the natural resource. On a monthly basis, Mofolo realises an average of K100,000 depending on the type of quarry stone extracted from underground. “It is a viable business because many people want to use quarry stones in their construction projects. However, the challenge is that it is very demanding and we continue to do it because it is our only source of income,” he says. Despite the business being illegal, Mofolo has big plans for the future; to find ways of speeding up extracting process and making huge profits. “I want to buy machines to replace the manual labour and establish a registered quarry extracting and selling company,” he says. 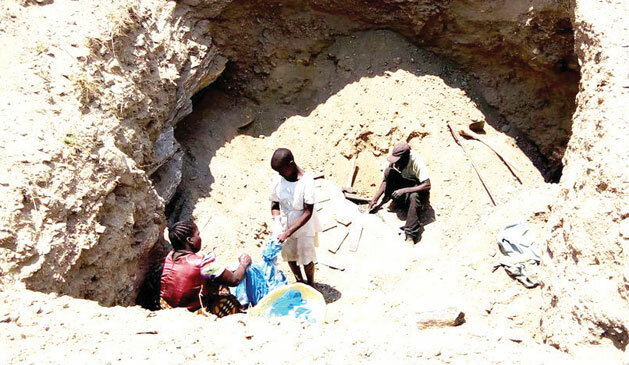 His wife, Rebecca, says ever since her husband embarked on the quarry business, life has changed. The family is able to get everything it needs. “We have a decent house, good beddings and we are eating well,” Life is good now,” she says. Rebecca adds that as a contribution to the business, she takes some time off the kitchen to help her husband in breaking the rocks. “To motivate my hubby, I prepare him sweet beer and I am mostly by his side in the trenches singing sweet songs just to keep him galvanised,” Mofolo’s wife says. In spite of livelihood improvement, a lot of damage is being caused to the environment through such illegal mining activities. The miners also risk losing their lives in case the caves collapse on them. They are also susceptible to lung diseases such as tuberculosis (TB) that come with prolonged inhalation of dust from the rocks as most of them do not use protective wear. Under Malawi’s Mines and Minerals Act of 1981, mining and trading of its products without a valid licence from a responsible ministry is a punishable offence. Should one assume that government is, by default, legalising the business by not taking action against those involved? Ministry of Natural Resources, Energy and Mining, spokesperson Sangwani Phiri says government recognises the existence of ASM which offers an alternative source of income to some Malawians. He says over 40,000 people benefit from this business including women, children and ex-miners. “The sector is informal and characterised by environmental degradation and use of traditional tools and often disregards occupational health and safety. There is no income saving because their money is from hand to mouth,” Phiri says. He, however, says lack of proper umbrella organisation for ASM has led to difficulties in supporting efforts to legalise the sector and help them with book-keeping and cost-benefit analysis. “Small scale miners can play a crucial role in poverty reduction and rural development if properly organised. I would advise the miners to form groups like cooperatives to be easily supported,” he says. Nonetheless, Phiri says government would continue to safeguard and regulate the mining sector by adopting policies and Acts that advocate for the promotion of the mining sector. The mines and minerals policy document of 2013 describes Malawi as a country that has abundant mineral resources which can be sustainably exploited to significantly contribute to the country’s economy. It says the mining sector can spur economic growth as evidenced by its contribution to the country’s Gross Domestic Product (GDP) which rose from three to 10 percent following Kayelekera Uranium Mine commissioning in Karonga. “It is the wish of the government to fully exploit the mineral resources and increase its GDP contribution by 20 percent in the next 10 years,” Phiri says. Known minerals that the country has include: uranium, heavy mineral sands, phosphate, bauxite, gypsum, vermiculite, precious and semiprecious stones, limestone, dimension stone, silica sand, sulphides and coal. There is also potential for discovery of other metallic minerals and high value minerals including gold, platinum group minerals and diamonds. So as government is developing the formal mining sector, ASM activities have also grown considerably in recent years with abundant potential to contribute towards poverty reduction and limiting rural-urban migration. European Union (EU) Ambassador and Head of Delegation to Malawi Sandra Paesen said at a recent mining meeting in Lilongwe that mineral deposits in Malawi must benefit Malawians and not foreigners. However, Paesen said a lot needs to be done especially regulation of the artisanal miners so that their acts do not cause environmental degradation and other hazards.